Artomatic Returns to Crystal City in 2012! The DMV's most spectacular art energy generator,Artomatic, returns to Crystal City in 2012 for their unique, massive, liberal and most Democratic free arts event, to be held in the biggest Artomatic building ever, from May 18 - June 24. 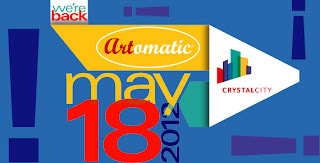 Artomatic will partner with the Crystal City Business Improvement District (BID) to transform the Transwestern Presidential Tower at 2511 S. Clark St. in Crystal City into a vibrant arts community that celebrates creativity and creates a unique and exciting event for tens of thousands of visitors - all free to visit. Registration information to exhibit work at Artomatic will be available soon. Meanwhile, check it all out here. The Bethesda Arts & Entertainment District is looking for local and regional artists to display and sell their fine art and fine craft during the Bethesda Artist Market. This year’s Market will take place on three Saturdays this summer: June 9, July 14 and August 11. · Each artist must submit five images of their work and one image of their booth. · The images must be representative of the work the artist plans to exhibit at the Bethesda Artist Market. · A non-refundable entry fee of $15 must accompany the application. · A $50 booth fee will be required for each Market the artist attends, due after artist is accepted into the show.